All you who think this blog is going to be about Tim Hortons or Starbucks, you are in for a disappointment. I love both of those places and I love a good mocha. Not too often because they go straight to the hips. The Mocha I am talking about is Alethea's pet rabbit. 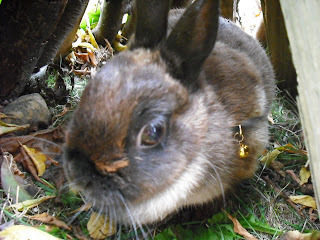 She is cute enough as rabbits go, (actually she is cuter than most) but she is still a rabbit. She is a dwarf with perky little ears and a very nice color. So she's pretty cute, right? Well, I think this rabbit has issues. She has a nice big cage with beautiful clean wood shavings, a water bottle, a little house for that safe feeling, (which she never uses) and even toys for entertainment. In the summer I don't even mind her, but now that it is colder and rainy outside, she lives in the house. She puts her nose down in the wood shavings and pushes them around until she has a pile of them on the floor. She doesn't seem to care that she pushes her nose right into the corner where she poops and pees. So now I have wet wood shavings and little round balls of poop on my floor. And she stinks. Not her cage so much because Alethea cleans it regularly. She, Mocha, stinks. If Alethea or Grace hold her while they watch TV, I can smell it on their cloths later. I don't know why she stinks. She just does. I think I would rather have Chris's Frankie in my house. I might change my mind if I tried it for a while, but I'm pretty sure I wouldn't. Anyway, this is what you get for a blog when I am supposed to do this every day. I know, I know. I missed yesterday. I was busy with Mom. And then later with Jack. So this is all I have. I need to go get ready for Shawn and Steph's wedding. she's a pretty cute little thing though!! I wish we could have a pet! Bunnies are so cute and fluffy! Total squish worthy too. We had rabbits once. Then the kids stopped feeding them so I gave them all away. That was after the first ones got out and populated the neighborhood. I ♥ bunnies. That one included.